The colder, darker days are now upon us, with the winter solstice (the shortest day) less than a month away. For those in the hotter bits of our country, this will come as a bit of a relief. However, for those of us who are tucked down in the more temperate parts, winter can bring some motoring challenges. Whether we do our driving on the open road or around town or a mixture of both, the cops and other experts tell us that we should drive to the conditions and that the speeds and driving styles that suit fine sunny days with no wind aren’t quite what’s appropriate when things are darker, wetter, windier, frostier, etc. 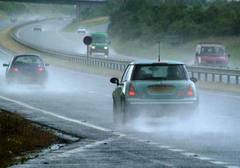 The civil engineers and traffic analysts who study crash patterns so they can make roads safer always record whether an accident took place in rainy weather or something other than fine days. If you haven’t already had some advice on how to drive in the curlier weather conditions that winter can throw at us (and other seasons – let’s admit it), then here’s some tips to follow. Rain: Slow down. Water reduces friction, and the road surface is covered with it. The slicker the road surface and the slicker your tyres, the more likely you are to get into a skid. Allow extra distance for braking on corners or in when following. If you don’t have the rain-sensing window wipers, then make sure that you use your wipers and get them at the right speed. It’s usually wise to check your wiper blades at the start of the wetter weather and make sure that they’re in good nick – replace them if necessary. Try to avoid going near or crossing rivers that are likely to flood. Hail: Hail is like rain but more so. Ice is even more slippery than water and hail can sit around on the road for longer until it melts. If hail is particularly heavy, pull over and wait until it eases. It doesn’t happen often, but you do hear of hailstones that are big enough to smash windows, and you don’t want to be travelling at speed if one of these falls and collects your windscreen. Strong wind: Very strong winds can make taller vehicles unstable, especially vans and trucks. On other vehicles, cross-winds and headwinds can exert quite a lot of pressure on your car. Watch out for places where you go from sheltered spots to exposed spots so the wind doesn’t take you by surprise. Always watch out for whoever’s in front of you. Motorbikes and bikes may be overbalanced by sudden gusts, so be prepared to stop or swerve to avoid them. Also watch your load if you are towing a trailer – stuff is more likely to be blown out in a high wind, so make sure your load is covered properly. Watch out for debris when driving in a high wind. Normally, an old newspaper isn’t much of a driving hazard, but if it lands on your windscreen and gets caught in the wipers, it will be. Also watch out for trees and power lines coming down. If you do get a power line coming down and the wires fall on your car, turn your engine off, stay in your car and don’t touch anything metal. You’ll have to wait until the experts come and get you out, so find some way of amusing yourself. Fog: Slow down and put your lights on dip, unless you have fog lights. If you do have fog lights, turn them on! Depending on how thick the fog is, you may need to slow to an absolute crawl to make sure you can stop or turn in time when something looms out of the fog. In our neck of the woods, a mother and her daughter were travelling home at night and ploughed into a mob of cows while driving in foggy conditions. Thankfully they were ok, but the late model Commodore was a complete right off! Frost: Be careful on corners, as you will have next to no traction. Slow down, and brake gently well in advance. Be especially careful on bridges during light frosts, as bridges don’t have the insulating effect of earth underneath the middle and can be frosty when other bits of the road aren’t – I’ve had a close call with these conditions. If you are going over the Tasman for the winter, you may find that some New Zealand roads have loose grit put down on them do increase the surface area of roads in frosty conditions – drive these like a regular gravel road. Snow: We’re unlikely to get the sort of snow that blocks the roads for days over here, but it’s always best not to drive in snow if you can avoid it. If you do have to drive in the snow or if you want to have fun in the snow – for example, if you’re a ski bunny – carry chains and a shovel, and slow down. You’re handling ice, so watch out when cornering. Thunder and lightning: Treat this like you would rain and hail, and be prepared to pull over and stop if things get really hairy. Your car is pretty well insulated, so it can take being struck by lightning, so stay in your car during a thunderstorm, even if you break down. Tornadoes: These are unlikely, but you never know – they had a fatal tornado across the Tasman, so we might get a nasty one here. Advice from the US suggests that you shouldn’t try to out-drive a tornado but you should get out of your car and get into a building as soon as possible. May the 11th 2011 saw the launch of a new initiative by the United Nations (UN) in combination with the World Health Organisation (WHO) known as the . This is an international movement to reduce the number of people who are killed on the roads. Let’s face it: we love driving, but it’s one of the riskiest things we’ll do, according to the statistics, and this isn’t just a problem for Australia. The UN wants organisations and governments around the world to work to make roads everywhere safer. The goal of this movement is to save 5 million lives (that’s more than the population of our neighbours across the Tasman, i.e. New Zealand) over this ten-year period. What are some of the things that the Decade of Action For Road Safety are doing? The broad goals include developing better, safer roads; designing and manufacturing safer cars; what the UN call “enhancing the behaviour of road users”, otherwise known as driver education; and improving post-crash care so people have more chance of surviving a road crash. Road crashes go beyond just car crashes; it also involves bike accidents. This decade has only just been officially launched, so at the moment, raising awareness is the name of the game. Events are being planned worldwide, with the first one being projection of the (which looks like one of those familiar yellow diamond road signs) onto international landmarks – including the Sydney Harbour Bridge. You can buy the tag to wear as a fashion statement (and as a way of funding research into this area), and we’re going to see it turning up all over the place. This is all very big and very exciting, but what can the average Aussie motorist do to contribute to this global plan of action to reduce road deaths? Five million deaths prevented worldwide is a big target, but where it all comes down is to individual drivers. So what can you do? Be sensible. We’ve heard stories about people who buy a car with all the latest safety bits and pieces (e.g. ABS brakes, airbags, crumple zones, ESP) and then think that because they’ve got a safe car that is less likely to crash, they don’t have to wear their seatbelts. Bad idea. 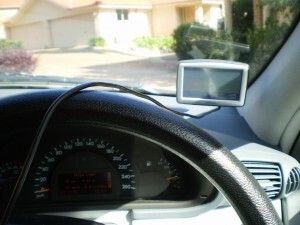 Have a look at your own driving. Have any bad habits crept into your driving style that are likely to contribute to a crash (e.g. cornering too fast or crossing the centre line to smooth a corner just like a racing driver)? You could consider signing up for a refresher defensive driving course or an advanced driving course to improve your skills in handling things like skids. Look at your transport options. We love our cars and you’d be hard pushed to do without one completely if you’re a typical Australian with a typical job, but most of us could probably find a few trips in our week that really could be walked or biked. This is for two reasons. Firstly, it’s motorised transport that causes most of the fatalities on the roads, so if we can reduce the number of cars on the roads, we can reduce the number of fatalities. Secondly, if drivers see bikes on the road more often, they’ll get used to sharing the road and adjusting to the needs of cyclists. Buy one of the yellow tags to help fund research into safer road design. These are available as badges, necklaces, mini-tags and reflective tags for cyclists and pedestrians. If you’re part of a non-profit organisation (e.g. a church or a school) then host your own event. Non-profit NGOs can use the official logo for free by signing up and letting the official organisation know more about your group and what you plan to do about road safety. Find out more at the official website: . Honda is set to join the likes of Rolls-Royce, Saab and BMW. You may be wondering what a typical middle-class family drive like Honda (which is not to run Honda down – they’re good cars that do the job they’re designed to do with flying colours, i.e. getting families from A to B in comfort and safety at an affordable price) is doing alongside luxurious European models. But we’re not talking about cars here: we’re talking about aeroplanes. Yes, Honda is set to launch the Hondajet and has got a working prototype up into the air successfully. Tests are still being carried out, so it’ll be a wee while until we get Hondas above the roads as well as on them. (If you think it takes time to get a car from concept to the car sales yard, it’s nothing to the testing that aircraft go through). Honda isn’t alone in being a car manufacturer that has branched out beyond just four wheels. BMW no longer makes aircraft but, like many European engineers during World War II, turned away from cars and motorbikes and went into aircraft instead to aid the war effort. This aviation legacy is retained in BMW’s logo, which is intended to represent the propeller of an aircraft. Saab still makes aircraft – in fact, aircraft is where Saab started (SAAB stands for “Svenska Aeroplan Arktiebolag” or “Swedish Aeroplane Company Ltd”). Saab’s real success stories in the aviation world are the Viggen and the Gripen, which were fighter aircraft that were used until quite recently as the plane of choice by NATO and prized for their ability to take off and land in rough conditions. This explains why the top-notch Saab car models often have the tag “Gripen”, “Viggen” or “Aero”. And some of that fighter jet technology has been popped into some of the latest cars as a safety feature. Saab is quite a military organisations, and it also makes weaponry and defence systems. And don’t forget the trucks, now that Saab has merged with Scania. You will probably find more Rolls-Royce engines in the air than on the roads. In fact, you’d be safe enough saying that Rolls-Royce is primarily a manufacturer of aircraft engines that does luxury cars on the side rather than the other way around, even though the man and woman on the street probably thinks of the posh car if you mention a Rolls. Mitsubishi: aircraft (kamikaze fighter planes a specialty in WWII), air con systems for homes, lifts, electric bits and pieces including medical equipment and a whole lot more (the Mitsubishi group is massive and is one of the largest companies in Japan, which says something). Suzuki: wheelchairs, motorbikes, outboard motors. Suzuki is a very common Japanese surname, so Suzuki cars have nothing to do with the company that produces musical instruments or with the method of teaching small children the violin. Lamborghini: heating systems, air con systems, water filters, tractors and front-end loaders. We’ve already heard of Volkswagen and General Motors experimenting towards driverless cars, and now Google has joined in. Google? What the search engine? Yes indeed. Their involvement stemmed from their camera cars travelling around the world taking pictures of people’s front yards. But now this technology has gone a lot, lot further. We have already seen some embryonic “driverless” options move into production – adaptive cruise control is one example, but that’s nothing compared with the latest on road research. Google seems to be a step ahead of the rest, though, as they are working with Stamford University and a talented engineering team headed by Sebastian Thrun who was the co-inventor of Google’s street mapping cameras. They have five Toyota Prius cars and have logged nearly a quarter of a million kilometres in varied road conditions in California, including the winding streets of San Francisco. Thrun has a very personal motivation in all of this, having lost a close friend in an auto accident when they were teenagers. He explains his motivation and shows some vivid pictures of the driverless cars in motion in this YouTube clip. It’s very impressive, as it seems to be able to handle all conditions, city back streets, freeways, night and daytime traffic and some pretty fancy obstacle courses at racing speeds. One thing’s for certain, there are plenty of pluses – better use of road space, much improved traffic flows, less stress (if you can stand being in the passenger seat with no driver) and better use of time. But what if there’s a glitch – a software failure, a bug in the system? Can you imagine the mayhem? Sadly there are many road fatalities everyday, but it only needs one to occur from a software malfunction to put a big question mark on the whole project. What do you think? Will it happen in our lifetime? Can you sit back and have nobody drive? The Gillard Government announced two pieces of legislation in the 2011 budget that might have escaped the attention of many, as they received very little press attention. A novated lease is a method of financing the purchase of a motor vehicle through your employer that can give some substantial financial benefits to you. But there have been a few drawbacks and complications, as the net impact on the employer and the owner has been dependant on the number of kilometres travelled each year. The budget has swept away this confusion and has now established a single tax benefit rate irrespective of the number of kilometres travelled. So, if you have previously looked at novated leases and walked away, it may now be more favourable for you. A surprise package in the Swan budget is a tax write off of up to $5000 for those wanting to buy a new car. In effect this means that, for example, a tradesman on a 30% marginal tax rate will receive a tax break of $1275 when buying a $34,000 ute. But there’s a catch. This won’t come into effect immediately. In fact on current plans you’ll have to wait awhile, unless the automotive industry’s lobbying for immediate implementation is successful. There are many of us out there with ‘Houdini’ children that can climb or escape from anything your adult brain can think of. The problem with that is safety of your most precious cargo. Strapping your child into a secure safety seat is still the most highly regarded method of securing your children against the unforseen. Today’s regulations also state that you must have children up to the age of 7 in at least a safety ‘booster’ seat if they are over 15kgs in weight. But what if you have the clever child that just knows how to get out? Even worse; the ones that pops through the front seats to say – ‘Hi mum’. Studies have shown that children today are far smarter than we ever were. The abundance of information available to them through technology gives them ideas that you and I never would have imagined. The best way to handle this dilemma is to engage it at the earliest of ages. The earlier you can swing a win for the driver the better it is. Not forgetting the licence points you lose and the fines that come with it! In these circumstances you need to pull over as quickly and safely as possible and wait quietly (hold onto that mixed scream of loving concern and blind anger). Most children will buckle under the silence and wonder what is going on. The only answer is to say (firmly) the car DOES NOT MOVE UNTIL EVERYONE IS SECURLY AND SAFELY BUCKLED IN. If need be, help them back into their seat and lock them in again…if they can’t do it themselves. This may take several efforts, but in the long run we all know that most of our driving (with children) is about them. Acknowledge that the delay will only impinge on THEIR FUN and not yours and that ‘SAFETY FIRST’ is the only important factor in this trip. Some people may have to go as far as cancelling the outing, but which would you rather? Children will learn to respect not only road rules – but you, very quickly. There is no meeting or school event that is worth more than the lives of our children. Keep that in mind the next time you blow your stack while driving at 70kms per hour and turning your back to the windscreen to make sure they can see how angry you are!!! That truly does not work. Nor is it at all safe. The best advice for installing the seats is to follow the manufacturer’s fitting instructions, always use Australian Design Rules anchor points or ISOFIX points, or if you are still unsure go to an authorised fitting station which you can find here: http://www.rta.nsw.gov.au/cgi-bin/index.cgi?action=authrestraintfitting.form . 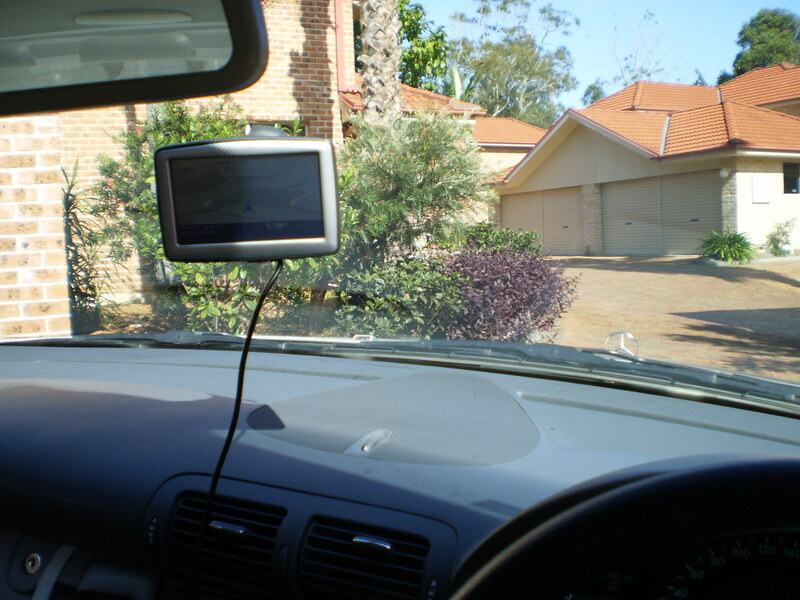 Stay cool and check your precious cargo regularly through the rear view mirror. It wont be long until they are driving you! The police assert that if you locate your sat/nav within the sweep of the windscreen wipers (as shown above), then it creates a visual obstruction and a hazzard and you can be fined. They probably have a point, but where else do you put it? Well, it is suggested by the authorities that you locate it on the bottom right hand corner of the windscreen, right out of the way. But this means that you have to run the power cable across in front of you to reach the power socket, and that could cause a bigger danger. Of course you can buy a packet of self adhesive cable ties and run the cable as you need to, if you can find a matching colour for your trim. We couldn’t, all we could find from several auto stores and electrical outlets were white sticker packs that certainly didn’t look so good stuck on the dashboard! Furthermore, if you have a passenger who can help you by reading out the instructions, it’s not much use out of sight. 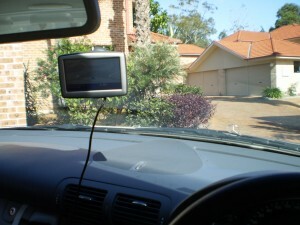 So we reckon the best spot is centrally mounted, out of the wiper sweep and easy for driver or passenger to read. But then we are not absolutely sure we won’t be fined by Sergeant Plod! What do you think? Is this over-policing? Are they being sensible, or unnecessarily officious? 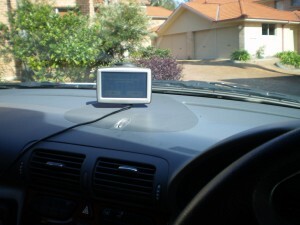 Where is the best -and safest place for the sat/nav? Have your say on the post below – we want to hear from you. FOOTNOTE:- Our March Newsletter revealed the story about Hands Free Mobiles. It really created a furore, with the vast majority of our readers against the thought of banning hands-free mobiles in cars, and we are not the only ones. A spokesman from the Department Of Infrastructure and Transport told us “There has been a large public reaction to the draft strategy.” So a ‘refined’ version of the strategy is expected to be discussed by the various State transport ministers when they meet later this month. We’ll keep you posted. General Motors has just posted first quarter earnings of US$3.2 billion, its fifth consecutive profitable quarter and its best quarter in more than a decade. 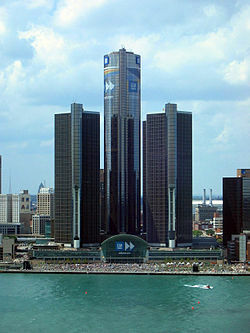 General Motors was one of the most high profile bankruptcies of the GFC. But after a massive sell off and plant closures it has now emerged as a meaner, greener and substantially more profitable outfit. It’s not out of the woods yet though, as it still has massive debt to pay back – the US taxpayer still owns more than a quarter of the stock. However it is heading on the right track, particularly after the world wide success of the Cruze compact – which is now made in Australia for the local market. GM execs claim it won’t be long before they regain the mantle of the World’s largest auto manufacturer. For a lot of us, the desire to travel is stacked up heavily in our genes. Then there are those of us who would much rather stay at home. Some of us may be partial to eating rather well. And then there are those who are happy with cold chicken noodles and the odd flaccid carrot. So what happens for those people where much travel and eating heartily go hand in hand? First of all, count yourselves rather lucky and see yourself as one of a very special breed. The pleasure of both seeing the sights and eating out go together like a duck takes to water. So what are the favourite food outlets for the serious traveller? And what’s easy to eat while driving? Googling for my answer found me arriving at inverts.com.au. I was very pleased to see that nearly 23% of voters were of the ‘Don’t be lazy’ category. These were the people that made their meals at home. How easy is that to do on a journey, though? Do many of you go to lengths to carry fresh ingredients on any trip of great length? 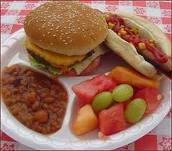 Are you prepared to put some forethought into your meals and prepare your food before setting out? It makes a lot of sense, and definitely saves on cash, if you can take some sandwiches, fresh fruit, water and slices that you have prepared before setting out from home, the motel room or the tent. I guess those of us who have a campervan will carry all the ingredients to make a first-class meal at any time of the day. If you are travelling by car and are, perhaps, on your own, you can still purchase a lot of good food from a supermarket and store it in the boot – obviously the things that need to be kept cool can be placed in an eskie. Sure, preparing your own food means that you have to be a little more organised; however, you may well eat healthier and save yourself a few dollars. Sandwiches and filled rolls are also convenient to eat while driving, as they are perfectly designed to fit in the hand. The same goes for many other home-made bits and pieces, as most of them stay together and don’t need tricky wrappers to be removed with one hand while at the wheel. Pizza and Subway© were similarly the next favourite takeaway, mentioned. Subway is definitely one of the healthier takeaway options, and would have to rate highly on my favourites. The beauty of a takeaway is that they are so convenient while on the move. The problem is if we ate nothing but takeaways for each meal while taking in the sights, our girth measurement is going to enlarge itself rather quickly. If you like drive-through meals, though, you’ll have to look elsewhere, as pizza outlets and Subway can’t do drive-throughs. Those long submarine sandwiches can be tricky to eat at the wheel, but it is possible. Indian and Chinese takeaways are the next favourite dishes. Very tasty! However, if you eat them in great quantities, you are going to be a rather fat little hobbit before too long! It can also be rather tricky to eat this sort of food inside your car. Chopsticks and gear sticks don’t mix very easily. Then there is the rest of the takeaway variety. I’m sure you can fill in the popular contenders. For one of the more interesting dishes: I’ve heard that Adelaide does a great pie floater dish. This is where your favourite pie is served floating in pea soup and then is quickly sunk with lashings of tomato sauce poured on top. Put a few of the pie floaters away and you’ll be sinking a few ships! If you’re going to eat this in your car, stop first. Pea soup is not all that nice to clear off the upholstery. Plain pies are a bit easier, but beware of gravy welling out of the pie and getting all over the wheel and your clothes. Take small bites. Fish and chips are easy enough to eat at the wheel – tear a hole in the newspaper wrapper (if your local chippie still serves them this way) and pull the chips out one by one. If the chips are too hot, then hold them to the air vents rather than out the window. If cash isn’t a big deal, then a restaurant meal is definitely a great place to go for a classy meal, good food, and atmosphere. You have to incorporate a few of these meals on your travel, especially if romance is on your agenda. If you can afford it, one restaurant meal a day would sit nicely. Don’t forget the pubs. There are some great pubs tucked away that provide value for money meals, nice food and great company. Obviously, you can’t eat restaurant or pub meals behind the wheel, and remember to be sensible when it comes to drinking and driving.